The restructuring of the power industry under EPIRA facilitated the creation of new private monopolies that lord over not only the distribution but also the generation of electricity. The dominant position of these monopolies, controlled by billionaires in Forbes’ list of richest Filipinos and their foreign partners, is bound to further intensify under Aquino’s public-private partnership (PPP) program. 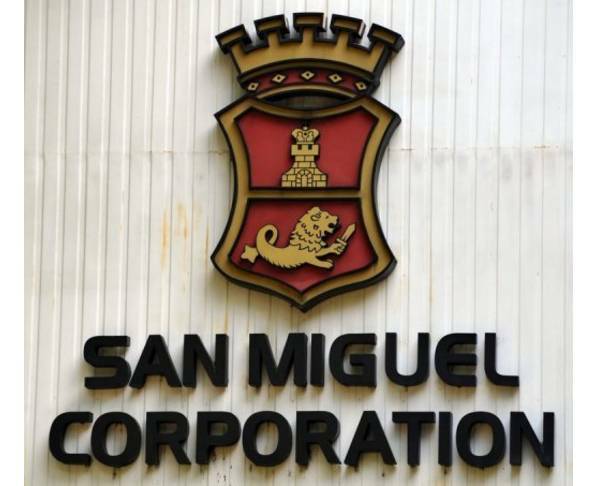 Out of the 7,665.88 megawatts (MW) in capacity of privatized generating plants and IPP contracts, Danding Cojuangco’s San Miguel Corporation (SMC) cornered 41.3 percent while the Aboitiz group bagged 28.5 percent. Other major buyers include the Consunjis (7.8 percent) and the Lopezes (7.4 percent). American firm AES Corporation accounted for a significant 7.8 percent. 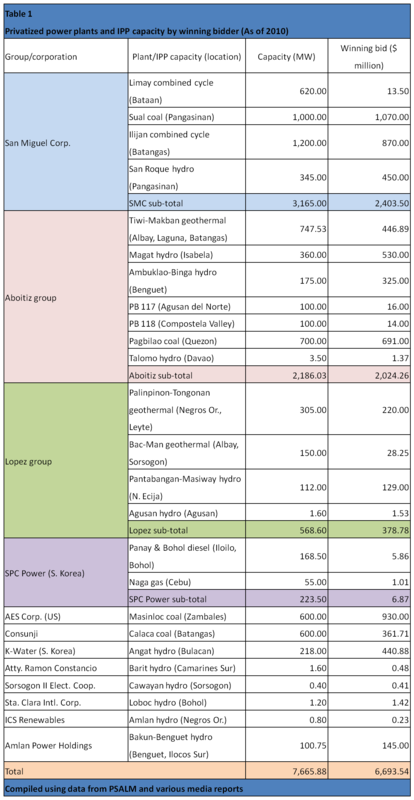 South Korean companies SPC Power and K-Water have a combined 5.8 percent. (It includes the Angat hydropower plant that was put on-hold by the Supreme Court.) Five companies accounted for the remaining 1.4 percent. 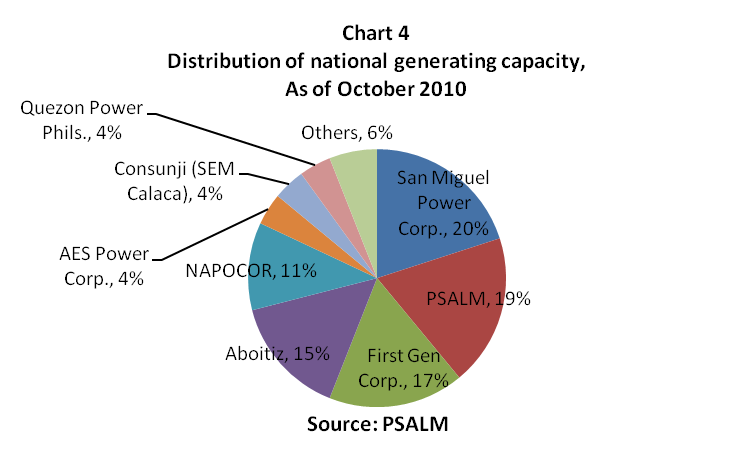 In terms of overall generating capacity, the restructured Philippine power sector is now dominated by just three companies – San Miguel Power Corporation (20 percent), Lopez-owned First Gen Corporation (17 percent), and the Aboitiz group (15 percent). Government through NAPOCOR and PSALM has 30 percent. (See Chart 4) SMC’s rise as a major player in the power industry is truly phenomenal considering that it has only started venturing in the industry in 2008. These are the same groups that also control the biggest distribution utilities (DUs) in the country. SMC and the Lopez group, for example, control MERALCO with 27 percent and 6.6 percent, respectively. (Manny Pangilinan’s Metro Pacific controls 45 percent.) MERALCO is the largest DU in the Philippines with a franchise area covering 24.7 million (about 25% of the national population) in 31 cities and 80 municipalities. It serves Metro Manila, Bulacan, Rizal, and Cavite as well as parts of Laguna, Quezon, Batangas, and Pampanga. The Aboitiz group, on the other hand, controls the second and third largest DUs – the Visayan Electric Company (VECO) and Davao Light and Power Company. VECO serves Metro Cebu covering four cities and four municipalities. Meanwhile, Davao Light serves Davao City and Panabo City as well as three municipalities in Davao del Norte. Aside from these DUs, the Aboitiz group also controls Cotabato Light and Power Company, San Fernando Electric Light and Power Company, and the DUs serving the Subic Freeport zone, Mactan export processing zone, and the West Cebu industrial park. SM tycoon Henry Sy has taken advantage of the EPIRA as well. His One Taipan Holdings (30 percent), State Grid of China (40 percent), and Calaca High Power Corporation (30 percent) control the National Grid Corporation of the Philippines (NGCP). NGCP holds a 25-year concession agreement (CA) with government to operate the country’s transmission system beginning in January 2009. Cross-ownership in distribution and generation, which EPIRA allows, makes claims by advocates of neoliberal power restructuring about transparency and competition in pricing an outright lie. EPIRA’s unbundling of rates, for example, is practically meaningless even if a consumer can see in his or her monthly bill how much he is paying for generation and distribution. Market abuse is not prevented even if rates are unbundled due to cross-ownership. This has been clearly illustrated in the operation of the EPIRA-created Wholesale Electricity Spot Market (WESM). The WESM, which has been operating in Luzon since 2006, is meant to among others “provide and maintain a fair and level playing field for suppliers and buyers of electricity”. But cross-ownership negates whatever benefits that the WESM is supposed to offer. The intention of the WESM is to make rates more competitive by offering prices other than those set in the bilateral contracts. EPIRA even capped at 50 percent the power requirements that DUs can source from their own generators and the rest they must get from other IPPs and the WESM. However, the WESM itself is dominated by the same generators that are related with the DUs. IPPs connected with MERALCO, for instance, account for 42.6 percent (SMC with 24.8 percent and Lopez, including Quezon Power, 17.8 percent) of the 11,652-MW capacity registered at the WESM. The Aboitiz group, meanwhile, comprises 13.1 percent. The huge shares of these groups to the WESM-registered capacity make the spot market vulnerable to manipulation and speculation. Case in point was early last year when the price of electricity at the WESM reached an unbelievable P68 per kWh at one point during the height of the El Niño. The high WESM prices have been blamed by MERALCO for the monthly increases in its generation charge last year. The latest adjustment in MERALCO’s generation charge worth 51 centavos per kWh, announced last Tuesday, is again being blamed at the high increases in the WESM, where rates jumped by P1.89 per kWh. MERALCO IPPs, on the other hand, increased their rates by a smaller 16.2 centavos per kWh. Finally, the country’s energy security has remained precarious under EPIRA. The rotating brownouts experienced in different parts of the country last year is a tell-tale sign that the power crisis has not been resolved by privatization. In Mindanao, for example, the power shortage reached as high as 700 MW in March 2010 that led to rotating brownouts of as long as 8 hours daily. Government quickly blamed the El Nño because Mindanao gets more than half of its power supply from hydroelectric plants. But apparently, the deeper issue is not drought but government neglect. During the Aquino administration, for instance, Mindanao’s power mix was 75 percent hydro while peak demand was 800 MW, according to a former NAPOCOR president. In 2010, DOE data show that hydro accounted for a relatively smaller 51.8 percent of installed capacity in Mindanao while peak demand was 1,288 MW. Thus, the El Niño could not be solely blamed for the shortage since no significant additional capacity has been put in the region. This should have been the job of government but because of EPIRA, it focused on selling the assets of NAPOCOR instead of installing additional capacity. Even Luzon was not spared from rotating brownouts during last year’s El Niño. Aggravating the low levels in Luzon’s major dams were the uncoordinated shutdowns implemented by privately controlled power plants. They include SMC generation plants Sual and Limay as well as the Lopez plants that use natural gas from Malampaya. The power supply shortfall reached 641 MW, which could have been easily offset by Luzon’s excess capacity and thus avoid the rotating brownouts. But because EPIRA has dissolved government’s role in ensuring power supply, there is no mechanism in place to fill the gap resulting from plant shutdowns. Its proponents argue that EPIRA must be given a chance to work because once fully implemented, the country will surely reap its promised benefits. They cite the impending implementation of the so-called open access and retail competition. Under this system, power consumers will have the opportunity to choose their suppliers. But then again, the industry has already been monopolized by a few players making the supposed option to choose an illusion. For its part, the Aquino administration and its allies in Congress have worked for the amendment of EPIRA to extend the so-called lifeline subsidy. But it still does not address the exorbitant and rising electricity rates that Filipino consumers are forced to shoulder. Besides, the subsidy is being paid for by other consumers and does not come from the pocket of MERALCO or government. Ten years of EPIRA is enough. Its defects could not be corrected by simple cosmetic amendments. It is fundamentally wrong to allow the narrow profit agenda of private companies and banks to take over a sector as strategic as the power industry.